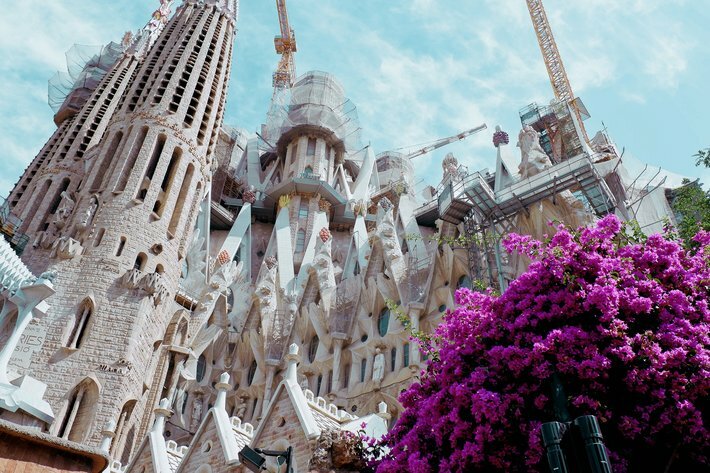 Keep reading and find out what Gaudí’s inspiration was, how much the construction costs annually and which famous writer said that it’s a hideous building! The construction of the building started in… 1882! It is expected to be finished by the year 2026, which makes it 144 years in total! As the famous quote goes, “My client is in no hurry” – God has all the time in the world. The temple has already outlived five generations… How lucky are those who get to see it fully risen? The temple has three facades representing the three major parts of Jesus life – his Birth (Nativity), his Passion, Death and Resurrection and his future Glory. The Nativity facade consists of sculptures with faces of real people – deceased Barcelona citizens and builders of the church. 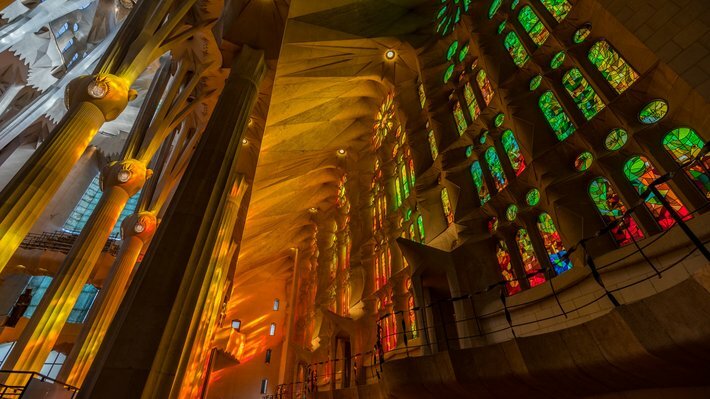 As much as it is a true monument to God and Christianity when designing the church, Gaudí did not want to exceed Him. That is why the central (and tallest) spire will be one meter lower than the apex of Barcelona’s coastal mountain Montjuic – according to him, God’s creation. 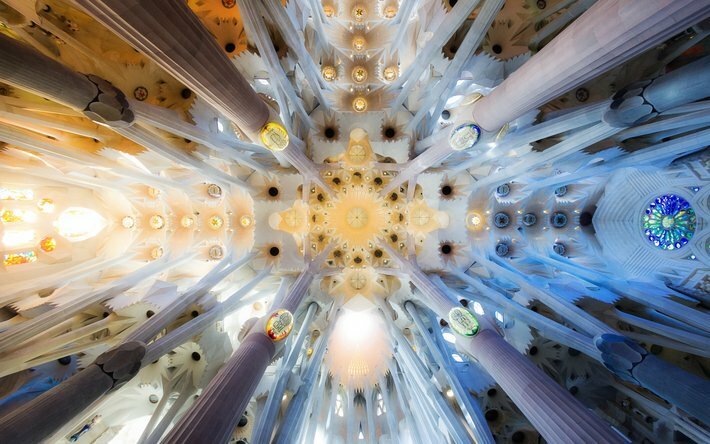 The two sources of inspiration for Gaudí was nature and Christianity, and those symbols are the base of the design. Gaudí once said that “I am a geometrician, meaning I synthesize.” Being exceptional in geometry at school, he introduced new forms into architecture – hyperboloids, paraboloids, helicoids, ellipsoids, represented in the vaults, staircases, columns… Just as in nature there are no straight lines, none of them can be found in the design. The Basilica attracts ~3 million tourists every year. That’s right – on average, it’s around 13 people per minute… Obviously, there are queues no matter the season, and waiting under the hot summer sun can be quite tricky! Purchasing the ticket online can make it a lot easier! It’s impossible to be exact, but the annual cost to continue the construction and maintenance of the church is around 25 million euros. The money comes from those millions of tourists’ tickets as well as various private donations. As any other masterpiece in the world, Sagrada Familia is quite controversial – some say that it has lost Gaudí’s essence and touch and is not what the artist dreamed of, some cannot appreciate its’ beauty, most famous of the crowd – George Orwell, who said that it is one of the most hideous buildings and regretted that it hadn’t been destroyed in the Spanish Civil War. Once it’s done, Sagrada Familia will have 18 towers in total, all of which represent Gaudí’s connection to Christianity. 12 of them are for the apostles, 4 for the evangelists, the one with the cross – for Virgin Mary, and the biggest one – for Jesus Christ. Besides being designed as an actual church, it has another practical use. Glass mosaics embedded at the highest points of the church are not only decor pieces – they reflect sun, moonlight and thus act as a guiding light for sailors! The famous architect was fully aware of the fact that he would not see his masterpiece finished. Hence why he planned the construction in modules, first of which was the apse and the Nativity facade, thinking that if he finished one of the facades, it would be more difficult to abandon the whole project for the architects and builders to come. The artist was indeed ahead of his time! A building Catalan architect Antoni Gaudí devoted his life to has been a UNESCO World Heritage Site since 1984 and stands as a monument to both the creator and architectural progress. No wonder it’s Barcelona’s number one tourist attraction and the city’s pride. 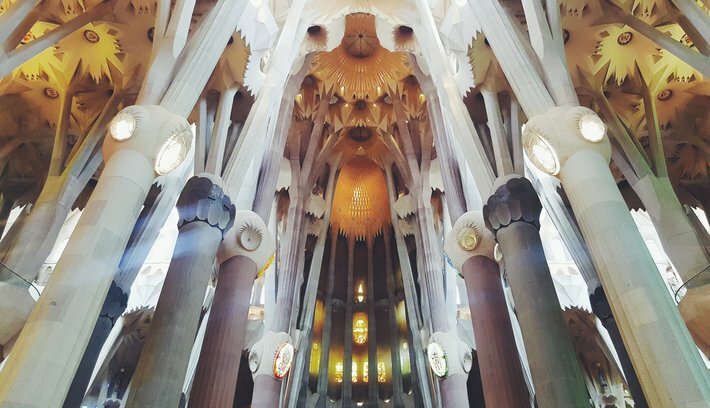 Thanks to the blueprints saved after the fire during the Spanish Civil War, technological progress, talented architects and builders, we have the opportunity to witness how faith, nature, and architecture work together creating a one-of-a-kind jewel. Find more information about the history and future of this masterpiece, book your tickets and much more HERE!